Just about every golfer wants to hit the ball farther. 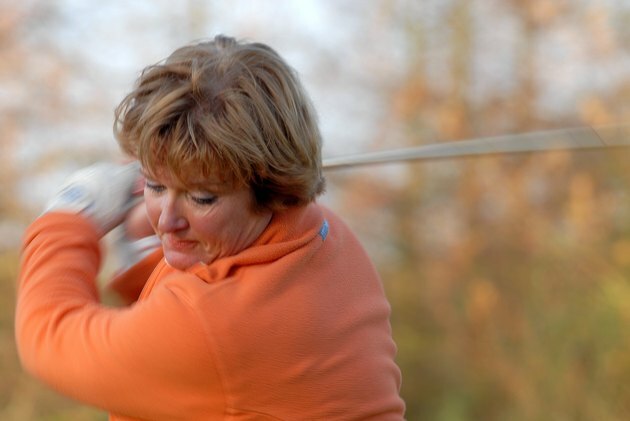 Unfortunately, you might be confusing hitting the ball far with swinging hard at the ball, a mistake that can cause you to lunge at the ball with your upper body on the downswing. The upper-body lunge usually sends the club over the top, resulting in slices and pulls. If you tend to lunge at the ball, you can improve your downswing with a few tips and drills from teaching professionals. PGA instructor Mike Malaska claims he can tell if you are likely to lunge on the downswing by how you set up to the ball. He looks for excessive tension in your arms and hands. Tension, Malaska says, interferes with your ability to hinge and unhinge your wrists properly. Because your can’t get leverage from your wrists, you start to overuse your shoulders, particularly on the downswing. Malaska recommends keeping your arms and hands relaxed during the swing. He says this makes it easier to start the downswing with the lower body. As a result, you will find it easier to keep your upper body behind the ball coming down. Malaska recommends a balance drill to cure your lunge impulse. Assume a normal address position with a 5-iron. If you are a right-handed player, Malaska wants you to pull your right foot back 12 inches and put most of your weight on your left foot. From that position, begin to make half swings and gradually build up to a full motion. If you lunge from that address position, you will fall off balance. On the practice range, Malaska recommends hitting five shots from the right-foot-back position then one shot from a regular setup to groove a lunge-free swing. Continue to alternate this routine until you feel your lunge under control. To calm down a lunging upper body, PGA professional Brad Brewer recommends making a full turn going back. On the downswing, he wants you to feel like your back stays turned away from the target as your arms start down. You should feel like gravity pulls your arms down to the ball to avoid any deliberate attacking motion with the upper torso. As a result, Brewer says you should feel the club come into the ball on a shallow, inside path. Brewer suggests two anti-lunge drills. The first drill is designed to teach you to feel gravity pulling your arms down. He wants you to stand up straight and extend your arms out from your sides. Then, relax your muscles and let your arms fall. That’s what the gravity fall should feel like on the downswing. As a swing drill, he wants you to put a tee in the vent hole of the club’s grip. Swing back to the top. As you start your downswing, feel like you are pointing the tee at the ball. This puts your club on the proper path coming down and prevents your upper body from leading with a lunge.